Thanks to Peter Woods who has pointed out to the New Zealand media that despite the recent Dubai “Torch” Skyscraper building suffering massive fire damage, it has remained structurally intact, unlike WTC7 on 9/11. Click Dubai-Fire to view the powerful images Peter has presented to our mainstream media. 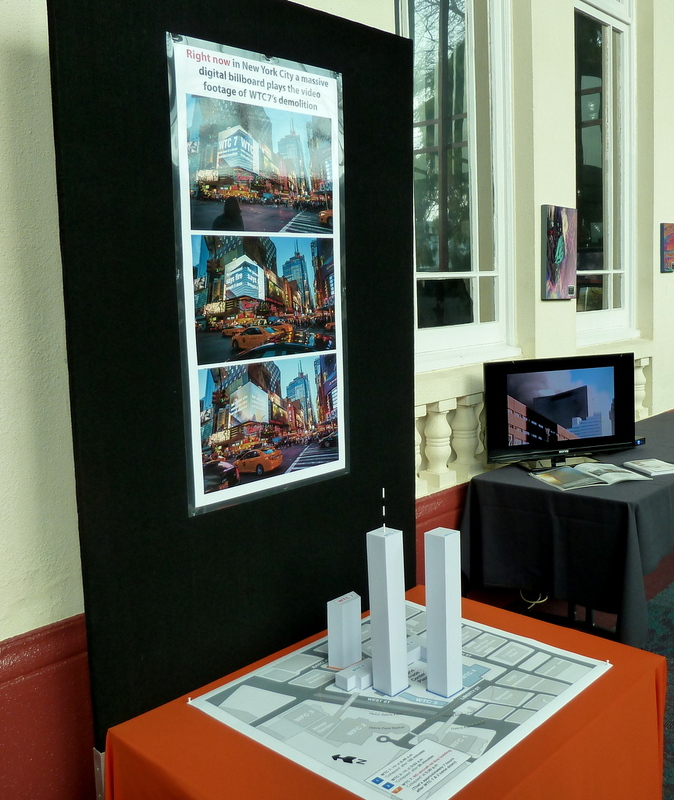 The 9/11 See the Evidence exhibition was held for the second time at the Rotorua Convention Centre on Saturday 20, Sunday 21 and Monday 22 September 2014. We were delighted this year to display the images of the digital billboard of WTC7 in Times Square in a prominent poster with Mike’s new impressive model of the WTC complex underneath. 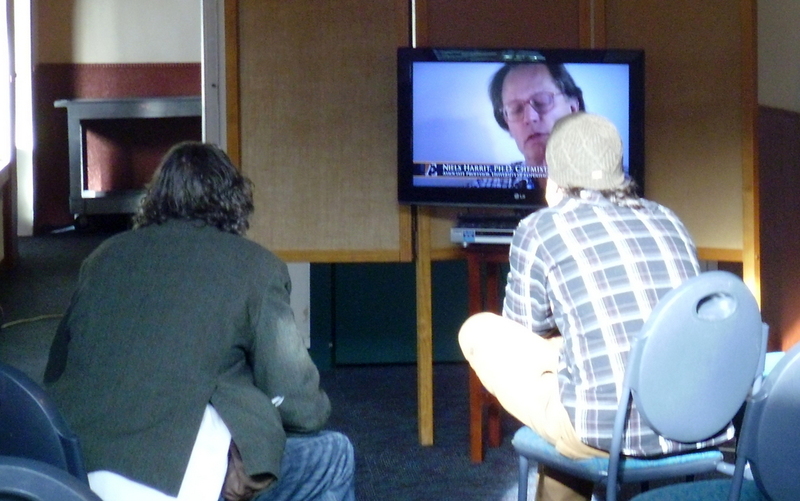 The exhibition also featured the looping clip of the compilation film of the ae911truth Experts Speak Out (the first four minutes summarising the new laws such as the NDAA) plus Solving the Mystery of Building 7 which captivated many of our visitors. 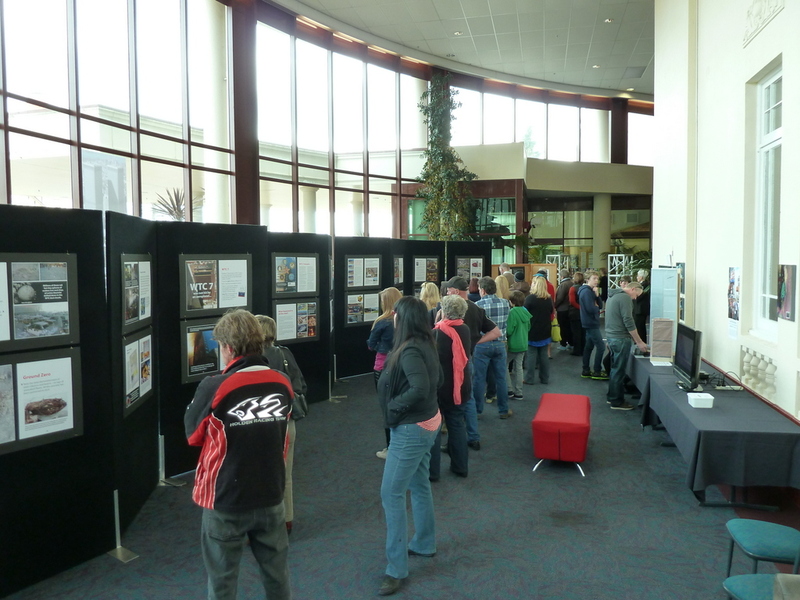 It was disappointing that our saturation leaflet mail drop and the media coverage we received in the Rotorua Review, along with Phillip’s interview on More FM, did not bring as many people as we expected, as the numbers attending were down on last year’s exhibition. There could have been several reasons for this: Saturday was voting day and the weather was bad with heavy rain. However, we still had over 60 people attend on Saturday, 80 people attend on the Sunday and over 50 on the Monday which was good for a working day. Despite the lower numbers, the people attending were fascinated with the exhibition. As we experienced last year, many people had never even heard of WTC7. This year we had a diverse group of people through, including visitors from the US. A young American student and his mother read every word and took all our information cards and the Experts Speak Out DVD. Even though they walked around a bit stunned and were very quiet, they thanked us afterwards and said “Incredible, I never knew about any of this”. We observed some people who were obviously in a state of cognitive dissonance as they soon realised that the information on the panels was conflicting with the official story. Some people made some disparaging comments such as “Why are you doing this exhibition?”, “Why are you telling us these things?”, “Why did we not see this information at the New York Memorial Exhibition?”. However, the majority of visitors supported what we were doing. For many people it was extremely informative and they thanked us as they left or made generous Koha donations. One woman initially made a $2 donation, then a few minutes later after going back to read some of the panels, returned a second to give another $5. Then amazingly after she had left, returned half an hour later just to drop another $10 in the Koha box! Clearly the exhibition had a strong effect on her. We received the typical questions people have when learning about this information for the first time such as “What happened to the four planes? and what about the passengers?” We encouraged people not to get bogged down with those details and to just focus on WTC7 and the unnatural ‘collapses’ of WTC1 & 2 and encouraged them to do their own further research. Free copies of Experts Speak Out and the ae911truth info flyer were available for visitors to take away. Viewers scrutinise the exhibition on display at the Boat Cafe. THIRTEEN years have passed but most people still remember where they were and what they were doing when news broke of the 9/11 terror attacks. NZ for 9/11 Truth rejects the official explanation for the disaster which saw four American airliners hijacked and flown into landmarks in Washington DC and New York. The tragedy resulted in 2996 deaths. 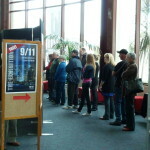 The ‘9/11 See the Evidence’ exhibition was staged in Wellington at the weekend and attracted hundreds of people. 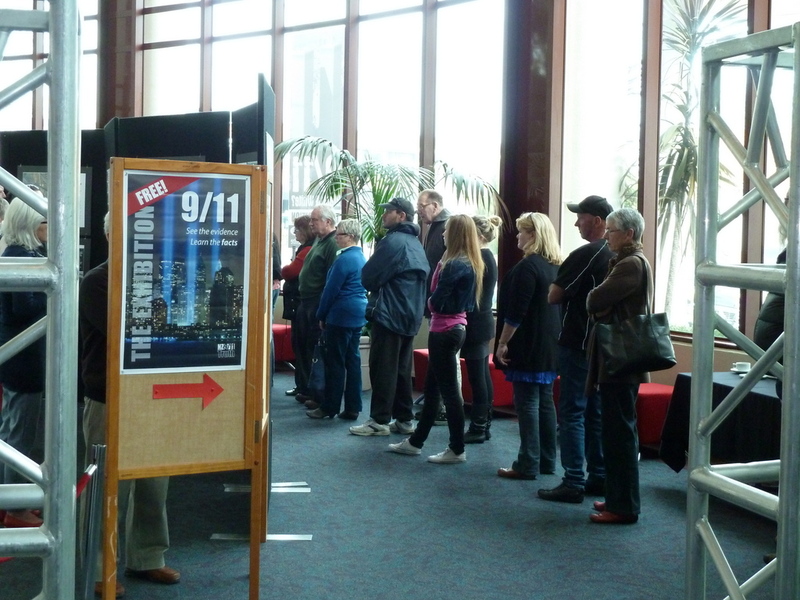 Our fourth “911–See the Evidence” Exhibition took place in Wellington this weekend on Saturday 13—Sunday, September 14. 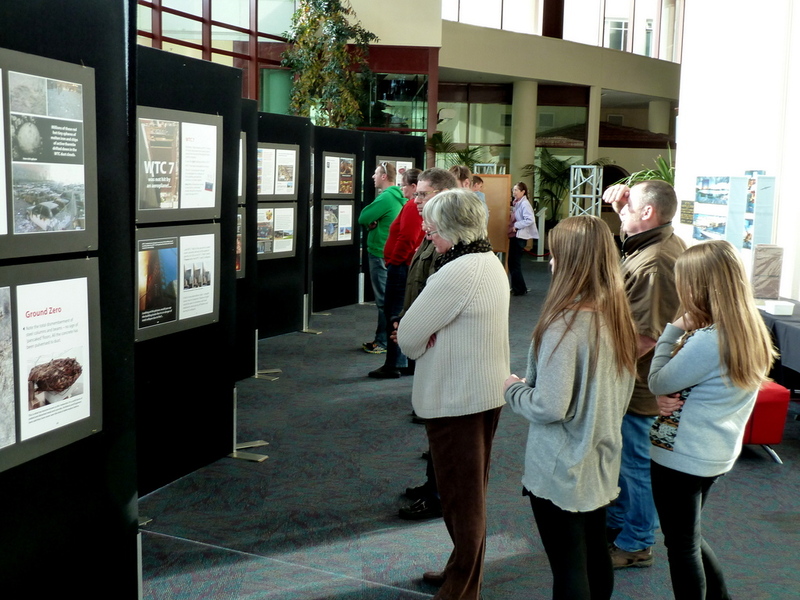 Hundreds of people came through the exhibition to see the evidence and learn the facts about 9/11. The exhibition was focused on Peter Woods’ visually compelling work from the graphic booklet, “911–See the Evidence”. The exhibition included the image of the Rethink 911 banner in Times Square New York City which we placed at the entrance to the photographic exhibit. This was an eye catching and powerful statement as to where the growing international 911 truth movement is at thirteen years on and it was also wonderful to also let visitors know about the digital billboard in Times Square of the collapse of WTC 7 as part of the Rethink911 campaign. We were also delighted to display the updated ae911 truth banner announcing “Thousands” of architects and engineers who support a real investigation. Video footage featuring the collapses of Building 7 and the twin towers and a compilation film of the ae911truth Experts Speak Out (the first four minutes summarising the new laws such as the NDAA) plus Solving the Mystery of Building 7 was also again on display. We were pleased to have a new addition to our model collection (below). 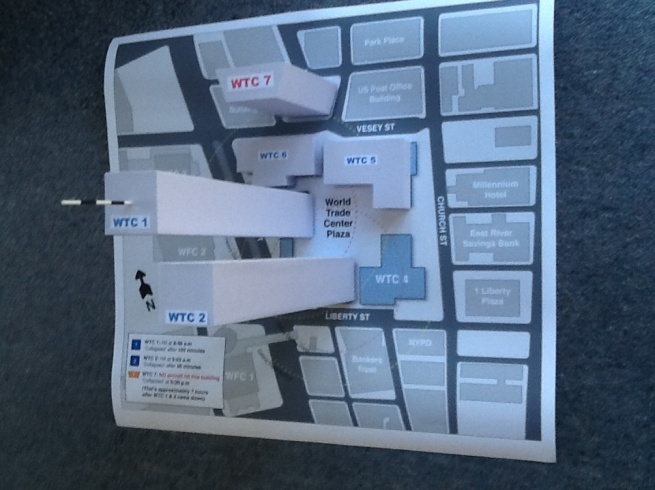 Mike Woods made a scale model of the WTC complex alongside a situational map of the building 7 in relation to the Twin Towers, which was a perfect accompaniment to Chris Ashley’s detailed scale model of WTC 7. We also displayed Jade Tuckwell’s impressive models of the Twin Towers which this year we placed at the end of the exhibition panels. The literature display this year featured a pdf of the newly released children’s book – The Three Tall Buildings by Dee McLachlan. Unfortunately we couldn’t get a hard copy in time so we had a pdf version of this story running on the laptop which both children and adults alike looked at. 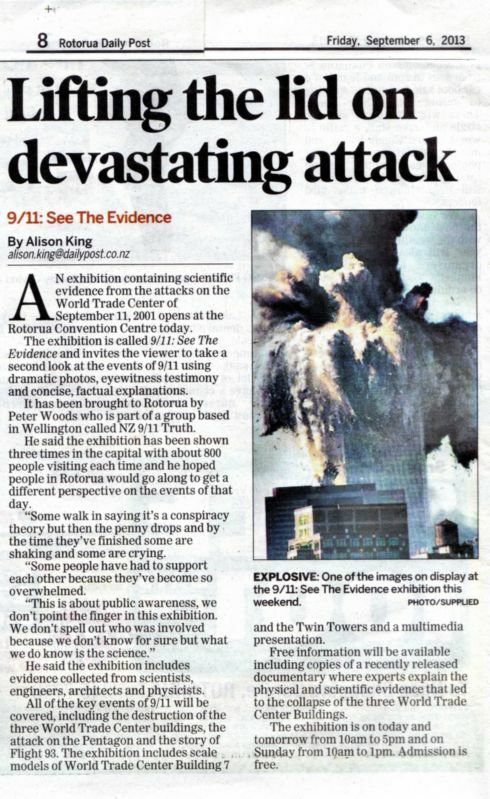 We also gave away copies of the latest documentary from ae911truth, Explosive Evidence, Experts Speak Out. The ae911truth flyer and a Recommended Reading List were also available for people to take away. This year we were also pleased to feature the work of 911 truth artist Roger Morris who displayed one of his thought provoking works of art and who travelled down to help us staff the exhibition on both days despite having injured himself the week preceding. Saturday was a slow and steady day with many people who were given flyers returning on Sunday. 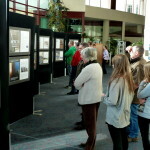 Like last year, as word got out in Wellington, Sunday afternoon was the busiest time at the exhibition. It was wonderful to see a diverse range of people of all ages, nationalities and backgrounds who viewed the exhibition, along with more families than in previous years. Even though the overall numbers were less than last year, most of our visitors this year were not previously aware of the 911 evidence. While we always enjoy talking with people who are already aware of the evidence we display at our exhibitions, our target audience is the great number of people who have still not been exposed to accurate reporting on the events of September 11 2001. 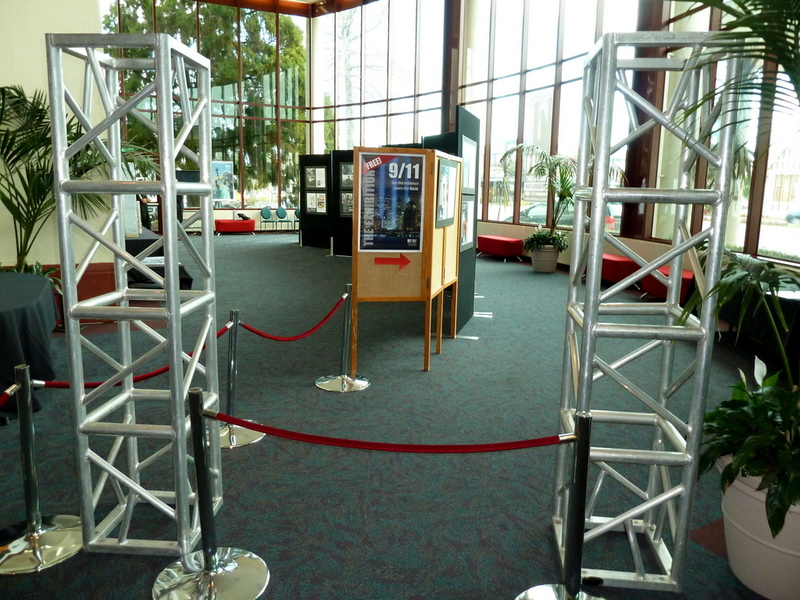 Many visitors were shocked at the revelations of information concerning Building 7 and their reactions were mixed. Some were confused and angry, but most were very thankful that we had revealed this information to them. Most amazing after all this time is that there are so many people who are still unaware of the third tower to collapse in free fall speed that tragic day. Thanks to Helen, Jade, Chris and Phillip in Wellington for all their hard work this weekend and generosity in donating to this exhibition, and thanks particularly to Mike Woods who facilitated the planning and marketing of this exhibition. Special thanks to Martin in Auckland for his generous donation, to David Ruddlestone from Raumati who helped set up the exhibition on Friday afternoon and to Jeremy, who helped set up the lighting on Saturday morning, helped staff the exhibition all day Saturday and returned to help with the pack out. A special thanks to Jade for bringing the crew custom-blended juice to help keep our energy and nutrition levels up! Sunday morning brought back the rain and wind from Saturday, but cleared up enough to generate more passers-by later in the day, and therefore more visitors during the second half of the day. Those of us in the exhibition room and on the street had the usual mix of mostly polite people and a very small number of hostile, truth-averse people. The arguments against our work are always expressed with a great deal of heat and little or no light. That said, we managed to make some progress in penetrating the hard shell of firm belief with some of the official conspiracy theory adherents. We find that talking to people who are learning new information for the first time to be the most rewarding part of our job. We recognise our great responsibility in encouraging people to think for themselves and to look for facts first before forming any conclusions. We wish Mike well as he travels with the exhibition to help Peter at the Rotorua Convention Centre next weekend. If anyone in other areas would like to exhibit the work in future, please contact admin@nz911truth.org. There has never been a more appropriate time to re-visit the events of 911. Following the successful exhibitions in Wellington in September 2011, 2012, 2013 and in Rotorua in September 2013, NZ911truth is pleased to again announce the exhibition of “9/11: See The Evidence,” – a series of images that documents the events of 9/11 using dramatic photos, eyewitness testimony and concise, factual explanations. The exhibition will also screen a multimedia presentation. Free information will be available including copies of the recently released documentary “9/11: Explosive Evidence Experts Speak Out”, where dozens of experts in architecture, building, engineering, chemistry, physics and other relevant technical fields explain the physical and scientific evidence that undermines the official account of what is behind the collapses of the three WTC Buildings on 9/11. (more info on this doco at: www.ae911truth.org). 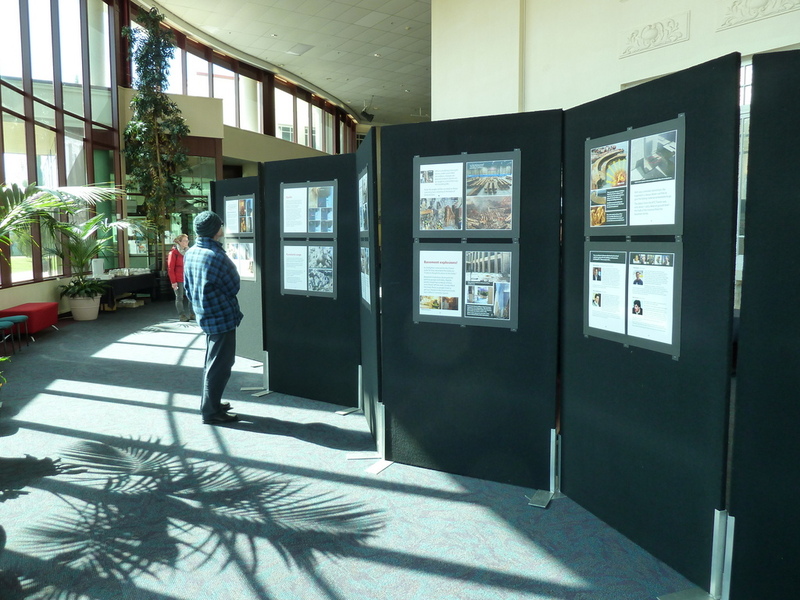 The 9/11 See the Evidence exhibition was brought to the Rotorua Convention Centre on the 6th, 7th and 8th September. This was made possible by the generosity of the Convention Centre management who allowed us to use this wonderful space as they could see this was a not-for-profit exhibition for public good. The exhibition space was by far the best the exhibition has been held in to date, with its high ceilings and plenty of natural light streaming in and free tea and coffee were available. There was a slight hiccup with a newspaper advert that had been booked in the Rotorua Review that ended up not running. We thought the exhibition was doomed to be a failure as we were relying on that advert to draw people in. Someone must have been looking down on us, because that very day Peter Woods got a call from Classic Hits wanting to do a verbal plug for the exhibition which aired the next day and the Rotorua Daily Post called and held a 15 minute interview from which they wrote a fabulous article which appeared in the newspaper the day before the exhibition opened on September 6th. With advertising in place and nearly 800 flyers hand delivered throughout the CBD of Rotorua, the turnout at the exhibition over the three days was excellent. We estimate close to 400 people would have viewed the exhibition by the end of the last day. As word spread, people started flocking in, especially on the Sunday, where crowds started to bunch up around certain display panels – but everyone was determined to read every panel, even if they had to wait their turn, because they found the information such an eye-opener. Out of the 400 or so people that viewed the exhibition, there were very few people that argued with the information. There was only one women who made a few of the typical disparaging comments such as, “Why drag all this up again now?”, “How could you be so disrespectful to the lives lost?”, “I know what I saw on TV and now you are telling us a different story”. There are some people we just cannot convince, even after watching the video of WTC 7, which was not hit by an aeroplane, collapsing at freefall speed. Some people had some knowledge of the events of 9/11 (other than what our media have told us), but most had never even heard of WTC 7, not even the journalists that turned up from the Rotorua Review! As predicted, no VIPs such as Government MPs or Mayoralties made an appearance, despite having it in their diaries to attend. We felt that this exhibition had a strong effect on people, as many felt they needed to support us by way of donations. One women made a special trip the next day just to give us $20 and to say thank you, as she had watched the DVD we gave her the day before and was obviously convinced by it. Young students who attended the exhibition also were moved by what they had just read and seen on the displays and plasma screens. One young man said to us “This makes my blood boil!” A couple of staff from the i-SITE office across the road came over and viewed the exhibition, and it was clear by the expression on their faces they were deeply troubled by the information. They raced back to the i-SITE and told other staff, and a few minutes later they too came to have a look. Passengers waiting for their bus were also sent to see the exhibition by the i-SITE staff. This exhibition, “9/11: See The Evidence,” invites the viewer to take a second look at the events of 9/11 using dramatic photos, eyewitness testimony and concise, factual explanations. All of the key events of 9/11 will be covered: the destruction of the three World Trade Centre Buildings, the attack on the Pentagon and the story of Flight 93. Free information will be available including copies of a recently released documentary where dozens of experts in architecture, building, engineering, chemistry, physics and other relevant technical fields explain the physical and scientific evidence that led to the collapse of the three WTC Buildings.